Credit cards not accepted. No service charge. Here is a new way of drinking tequila. Bartending expert Mini is from I-lan, and has over three years of cocktail mixing experience. The Tequila Stick (NT$200) is not something you can find everywhere. It is a drink that the customer can get involved in mixing. Three glasses are placed at the bar for the customer to finish mixing, then drunk with a thick straw, sucking in the alcohol and the brown sugar. The texture is very interesting, with the sugar granules that have not yet melted mixed with the fragrance of tequila and lemon for a lasting flavor. Even those with low alcohol tolerance will want to down it in one go. Those who prefer a stronger drink can choose the 75 proof Bacardi 151° as the drink's base. Every Wednesday is Ladies' Night; buy one cocktail and get one free. Fill one old fashioned glass with ice cubes and put the thick straw inside. In the other old fashioned glass, mash the lemon segments and brown sugar with the wooden cudgel for approximately ten seconds (too much grinding will result in bitterness). 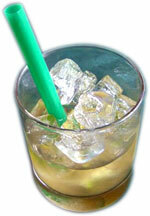 Once the fragrance is released, add ice cubes and tequila, mix gently with the straw and the drink is ready.